The Order FAQ will answer most of the questions you may have about ordering or downloading a product you purchased. 1. How Do I Know Which Products Include Private Label Rights (PLR), Master Resale Rights Products (MRR), or Resell Rights (RR)? We have included an indicator next to the title of each product showing the type of license rights comes for the product. There are several examples below for you reference. You can also see the detailed rights for any product by clicking on the product and then scrolling to the bottom of the product description to the section called "Distribution Rights" or "License." Marketing Basics (PLR / MRR) - Product includes Private Label Rights and Master Resale Rights. Marketing Basics (PLR) - Product includes Private Label Rights. Marketing Basics (MRR) - Product includes Master Resale Rights. Marketing Basics (RR) - Product includes Resell Rights. Marketing Basics - No Type Listed. Product does not include Private Label Rights, Master Resale Rights, or Resell Rights. Each product has a License Type listed next to its title. (PLR) - Private Label Rights. (MRR) - Master Resale Rights. No License Type Listed - No PLR, MRR, or RR rights are included. You can use the product for personal use. 3. Do I Need To Register For An Account To Purchase A Product? Yes, but it is really quick to sign up for an account. Just click on the link "Login / Register" in the top right corner of the screen to quickly get signed up. The reason we have all our customers sign up for an account is so they can login and get access to their current and past product orders along with printing out product order invoices. In addition, a customer account allows us to help you with any problems you may have accessing your product orders. You can signup for an account ahead of time or once you place your order. It is quick and easy. 4. How Do I Use A Coupon Code For Products I Want To Purchase? You can use a coupon code for a product you want to purchase by entering in the coupon code on the Shopping Cart page. Once you add a product to your shopping cart, you will see the Shopping Cart summary page listing the products you selected. Right below the product total, you will see a box called "Apply Coupon." Enter in your coupon code in the box, then click the Go button. You will then see a revised total with your discount being applied. Right below the Subtotal, you will see the Discount line. That is your total discount. If the coupon does not work, then that means you either entered it wrong or it is out of date. We have different promotions and sales throughout the year so make sure the coupon is still up to date. 5. What Payment Options Do You Offer? We now offer several payment options including PayPal, Credit Cards (Visa, MasterCard, American Express, Discover & More), eChecks, Bitcoin and more. If you have any payment issues, please contact us via our Contact Form. 6. What If I Was Charged For A Product But I Did Not Receive The Product (My Bank Says I Was Charged For The Product)? If you were charged for a product and did not receive the product, then it is possible that your email was put in incorrectly or was bounced as spam by your email provider. Check your spam or junk folder. Also, log into your PLRProducts.com account and check to see if your transaction was processed and you have a download link. You can follow the instructions below to learn how to log into your PLRProducts.com account. If you do not get an email and do not find any download in your account, then this means that your order did not get processed due to payment issues. Our payment processor is fairly strict and will reject payment from your bank if the name and billing address does not match exactly. Also, some countries such as Nigeria have had problems processing transactions using Visa type gift cards. If you run into problems with your transaction, then please try an alternative form of payment such as PayPal. As discussed above, if your bank or credit card company shows that you have a pending charge on your account but you (1) do not get an email from us and (2) your account shows no product orders, then this means that our bank has rejected payment from your bank or credit card company. This is how it works. You make a payment which your bank or credit card company authorizes and sends the payment to our bank. Our bank does fraud and other checking and if everything looks good, our bank accepts the payment and your order is processed. Otherwise, if the name, address, or other information is not correct, they will reject the payment from your bank or credit card company. This means we do not get paid and no order gets processed. Your account will still show a pending authorization for the payment your bank tried to make to our bank. So on your side, it will look like a payment was made but in reality it was not. Once your bank or credit card company gets the payment rejection from our bank, your bank or credit card company will then credit your account. The credit on your account can sometimes take several days or much longer depending on the bank and country. We have had to deal with this issue many times which is why we are including such a detailed description of the issue. 7. When I Paid For My Order I Get The Error "0 34, Your Billing Information Does Not Match Your Credit Card. Please Check With You Bank"
If you try to pay for your order and get this error, then it means your name and billing address in your account does not match your credit card or bank billing information. As discussed above, our payment processor is fairly strict and will reject payment from your bank if the name and billing address does not match exactly. Also, some countries such as Nigeria have had problems processing transactions using Visa type gift cards. If you run into problems with your transaction, then please try an alternative form of payment such as PayPal. If you have questions about the payment showing up on your account, then read the section above called "Authorized Payment Showing On Your Account Or Credit Card." You will read that our bank has rejected your payment and your bank will end up crediting your account. The credit on your account can sometimes take several days or much longer depending on the bank and country. Once you have paid for your product order, you will be returned to the PLRProducts.com store site. You can access your product order the two ways listed below. After you pay for your product order, you will be sent an email that includes the download links to the products you ordered. You can also access the products you ordered via your customer account as described below. Click on the "My Account" link on the top menu or the Login / Register link in the right corner on the main PLRProducts.com Home Page. 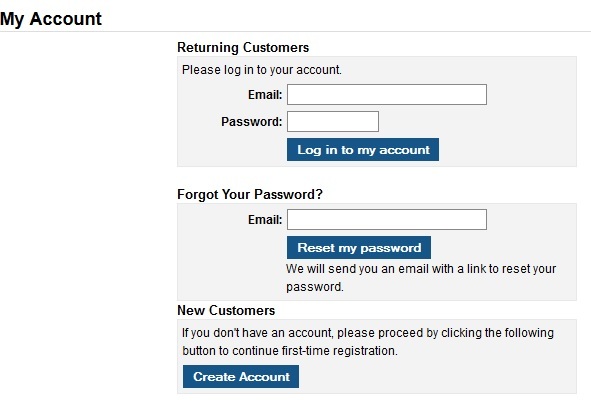 Under "Returning Customers," enter in your account email and password. Find your order on the Account screen under "Track Your Recent Orders." See Image Below. Click on "View Details" next to each Product Order# and you will see the Download link for each product. Click on the Download link to download the product file. 2. How Can I Access or Download My Product Orders In The Future? 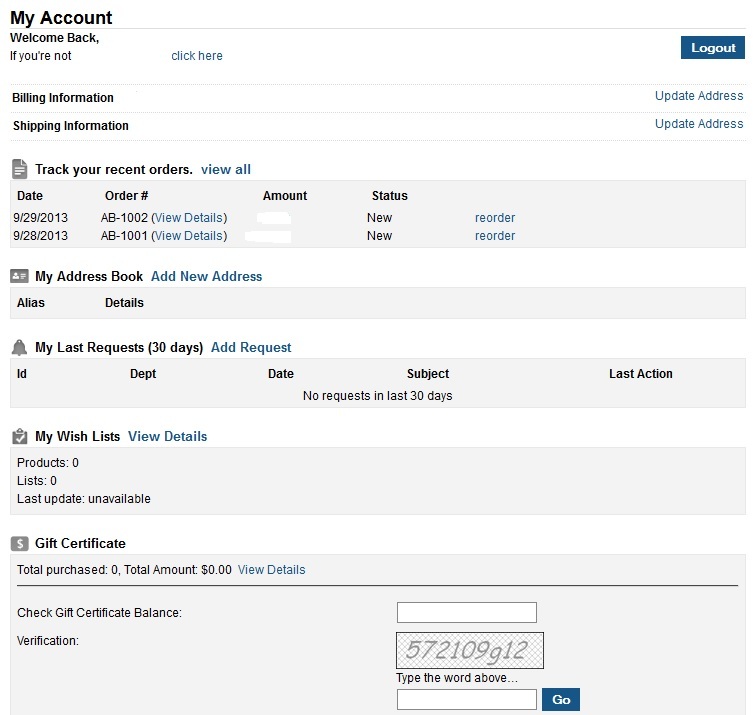 As long as you have an account, you can log into your PLRProducts.com account as described above and access all of your product orders and invoices. 1. What Formats Do The Product Files Come In? Most of our product files come in .ZIP format and some others in .7Z format. All our articles files are in either text format or Microsoft Word format. We use .ZIP format since it is the most widely used format and allows us to include many article files into one simple to download compressed file. 2. How I Do I Uncompress A .ZIP File? .ZIP format is the most widely used compress format and most computers have ZIP file program included that will uncompress a ZIP formatted file. You can also get free programs from the Internet that will allow you to uncompress these files. Some of these programs are WinZip at Winzip.com or 7-Zip at 7-zip.org. 3. How I Do I Uncompress A .7Z File? .7Z is another popular file compression format. You can get free programs from the Internet that will allow you to uncompress these files. The most popular one is 7-Zip at 7-zip.org. 1. What If I Have A Problem With A Product Order? If you have a problem with a product order, you can reach our Customer Support via our Contact Form. We always try to respond to your request within 24 hours. 2. What If I Need To Get In Contact With Customer Support? If you have any questions or issues that need to be resolved regarding our site, you can reach our Customer Support via our Contact Form. We always try to respond to your request within 24 hours. Due to the nature of information products being provided in downloadable form, we do not give refunds on the electronic products unless the file is defective or was ordered incorrectly. If you do have a situation that qualifies for a refund, please contact us via our Contact Form within 7 days of your purchase so we can process the refund for you. We will refund you the full purchase price of the products back on your original form of payment such as credit card, PayPal, etc. Once we receive your refund request and determine that is qualifies for a refund, we will process your refund within 48 hours.